FDA Reins In Drugmakers' Abuse Of Orphan Drug Law : Shots - Health News Following an investigation by Kaiser Health News and NPR, the Food and Drug Administration has moved to close a loophole that lets drugmakers skip pediatric testing of drugs to treat rare diseases. 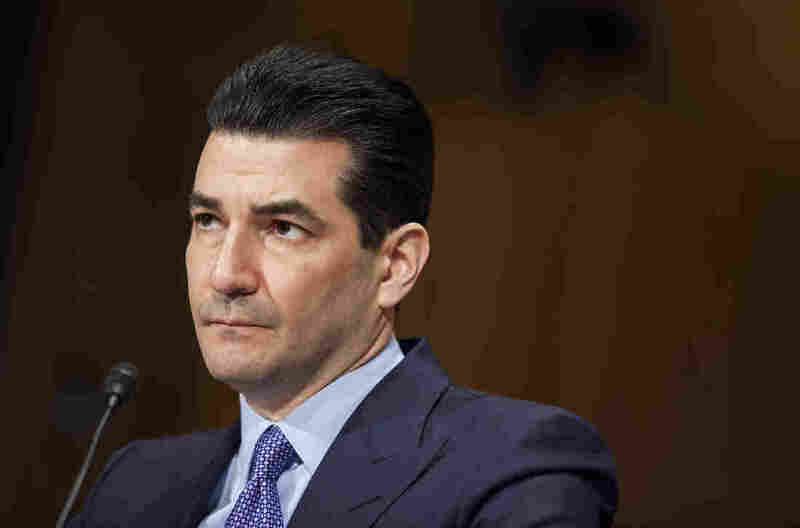 FDA Commissioner Scott Gottlieb says the agency will close a loophole that lets drug manufacturers skip pediatric testing in some drugs intended for children. In a blog post Tuesday, FDA Commissioner Scott Gottlieb said he wants to ensure that financial incentives are granted "in a way that's consistent with the manner Congress intended" when the Orphan Drug Act was passed in 1983. That legislation gave drugmakers a package of incentives, including tax credits, user fee waivers and seven years of market exclusivity if they developed medicines for rare diseases. An investigation by Kaiser Health News that NPR published and aired in January found that many drugs that now have orphan status aren't entirely new. Of about 450 drugs that have won orphan approval since 1983, more than 70 were drugs first approved by the FDA for mass-market use. Those include the cholesterol blockbuster Crestor, Abilify for psychiatric disorders, and the rheumatoid arthritis drug Humira, the world's best-selling drug. Gottlieb announced plans to close a loophole that allows manufacturers to skip pediatric testing requirements when developing a mass-market drug for treating rare diseases in children. An "orphan" drug is one intended to treat a disease affecting fewer than 200,000 patients. He also signaled that bigger changes are being considered, announcing a public meeting to explore issues raised by scientific advances, such as the increase in precision medicine and biologics. "We need to make sure our policies take notice of all of these new challenges and opportunities," he wrote. Gottlieb, through his agency, declined multiple requests for interviews. Over the years, drugmakers have fueled a boom in orphan drugs, which often carry six-figure price tags. Nearly half of the new drugs approved by the FDA are now designated for rare diseases — even though many of them also treat and are marketed for common diseases. Gottlieb became commissioner in May, a few months after three key Republican senators called for a federal investigation into potential abuses of the Orphan Drug Act. In March, the Government Accountability Office agreed to investigate. The GAO has yet to begin its investigation, saying it doesn't expect to start work until late this year, when staff is available. Regardless, in late June, Gottlieb announced what would be the first in a series of actions to shift the way the FDA handles orphan drugs. Eliminating a backlog in drug applications for orphan designation or status. Getting a designation is a critical first step if a company wants to win orphan incentives once the drug is approved for treatment use. And much like the rise in approvals, the requests by companies to get drugs designated with orphan status have skyrocketed. Gottlieb said in June that he wanted to get rid of the backlog; on Tuesday, he said the effort was complete. About half of the 200 applications from drugmakers won orphan status. Mandating that drugmakers prove their medicine is clinically superior before getting the market exclusivity that comes with being designated an orphan. The agency had lost a lawsuit in which a company said it was owed the exclusivity period regardless of whether its medicine was better. And two more lawsuits had been filed by Eagle Pharmaceuticals and, more recently, another by United Therapeutics. The FDA Reauthorization Act, which passed last month, made it law that a drug has to be clinically superior to get the incentives. Closing the loophole for pediatric orphan drugs by requiring that all drugs approved for common adult diseases, like inflammatory bowel disease, undergo pediatric testing when getting approval as a pediatric orphan drug. Pediatric testing is not required for orphan drugs, and last month, Congress mandated that orphan drugs for cancer be tested for children. The American Academy of Pediatrics celebrated the proposed change but noted it was only a "first step." Dr. Bridgette Jones, chair of American Academy of Pediatrics Committee on Drugs, said late Tuesday that orphan drugs are "still mostly exempt from pediatric study requirements." She added: "Children deserve access to safe, effective medications." The changes at the agency indicate that Gottlieb seems "concerned about all the right things," says Dr. Martin Makary, a researcher at Johns Hopkins Medicine who wrote a critical 2015 commentary on orphan approvals. "The government does a lot of lip service in general," Makary says. "This is not lip service." The restructuring has been swift in some ways. The approval process definitely sped up over the summer, according to Sandra Heibel, a senior consultant at Haffner Associates, a firm that helps companies submit orphan drug applications. "We are absolutely getting responses from the FDA back in 90 days," she says. "That has come through." Other changes to the agency, though, will evolve slowly. For example, the orphan drug office has begun reaching across the FDA's divisions for help in reviewing drugs. In May, the FDA's orphan reviews began to work with the office of pediatric therapeutics to review pediatric applications — ideally increasing the expertise applied when considering a company's request for orphan drug use in children. In an email Tuesday, the agency confirmed that Gottlieb's orphan modernization plan is part of a larger effort to increase competition and decrease drug prices. One focus is on targeted drugs — especially those that affect rare diseases or diseases for which there is no effective therapy, the agency said. "Such drugs present some of the biggest opportunities in medicine to treat and cure debilitating and very costly diseases," the agency stated.